Not the people of Cuba, although I am very fond of them. The sandwich. The sandwich that many of you have never heard of. Such a pity. If you grew up in Tampa, as I did, you could barely get down a commercial street block without encountering a Cuban sandwich. There is some debate over whether the Cuban originated in Cuba or was the result of the immigrant population that took root in South Florida, particularly Ybor City in Tampa, in the early 1900s. Considering that one of the integral ingredients in a Cuban is Swiss cheese, I’ll wager the latter. A Cuban should be made with Cuban bread, which is a long loaf with a palm frond baked into the top of it. You take the frond off before you make the sandwich, of course, but that’s what marks the authentic bread. Then it’s ham, roast pork, Swiss cheese, dill pickles and mustard. I have also seen the application of mayonnaise, which I wholeheartedly support. The absolute key to the greatness of this sandwich is that the bread is buttered on the outside and pressed until it is gloriously crispy. The reason I bring all this up is that I had a Cuban today from the Publix. You know of my devotion to Publix, not the least of which is that they stock authentic Cuban sandwiches in Brentwood, Tennessee. This is because they are a Lakeland-based grocery chain in Florida, near Tampa, and they completely understand the importance of a Cuban sandwich. Before Publix came to Middle Tennessee, I had to bring them back from visits to Tampa. I will never forget the first time I brought Cubans back and Mark stuck one in the microwave before I could stop him. I started to cry. There was no way to revive the bread. So, how do you make a Cuban? First, if you have a Publix just go there and get one. You can’t do better. If you are without Publix, find the best French baguette you can. Slice it and fill it with thinly sliced ham, thinly sliced pork tenderloin (you can also buy that at Publix), a couple slices of Swiss cheese, dill pickles and yellow mustard. Butter the tops of the baguette and press. 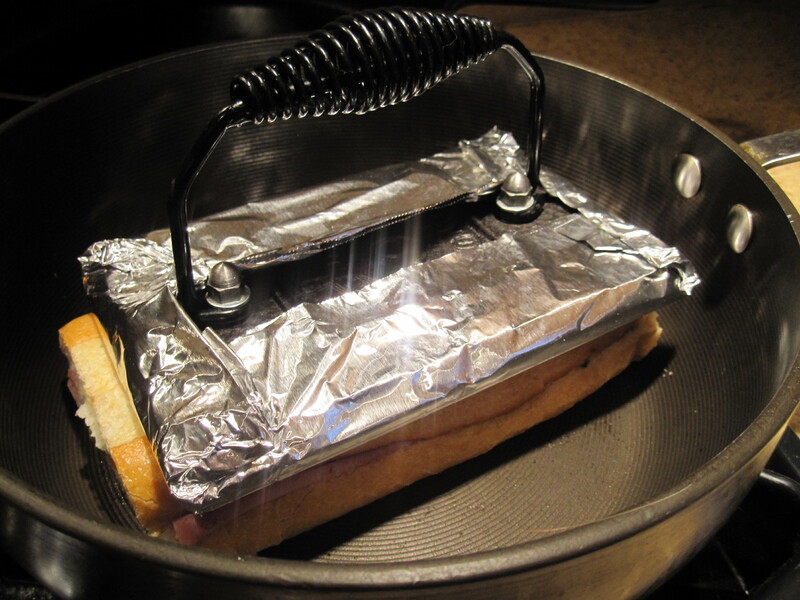 I must say by far the cheapest and most effective press is a bacon press from Lodge wrapped in heavy duty foil for easy clean-up. I’m going to leave you with another recipe, also from Publix, for a Cuban sandwich casserole. It has most of the components of a Cuban and is really delicious. By the way, back to my fondness of the Cuban people. This is a heartfelt sentiment. My first boyfriend was of Cuban descent. Gabriel Perez. He took me to my first prom. All you girls know that’s all I need to say about that. Many of my childhood food memories are wrapped up in Cuba. Black beans and rice at the Columbia restaurant in Ybor City. Ropa Vieja at a cafeteria-style restaurant in Tampa with fried plantains on the side. Many, many of my high school classmates and dearest friends are of Cuban descent. So much more interesting than my entirely and boring English ancestry. Where are the mojitos, English people? Where? Mouth watering. We moved to Sarasota when I was in high school and I will never forget my first meal at the Columbia in Ybor City. My aunt also treated me to lunch at their spot on St. Armands Circle. 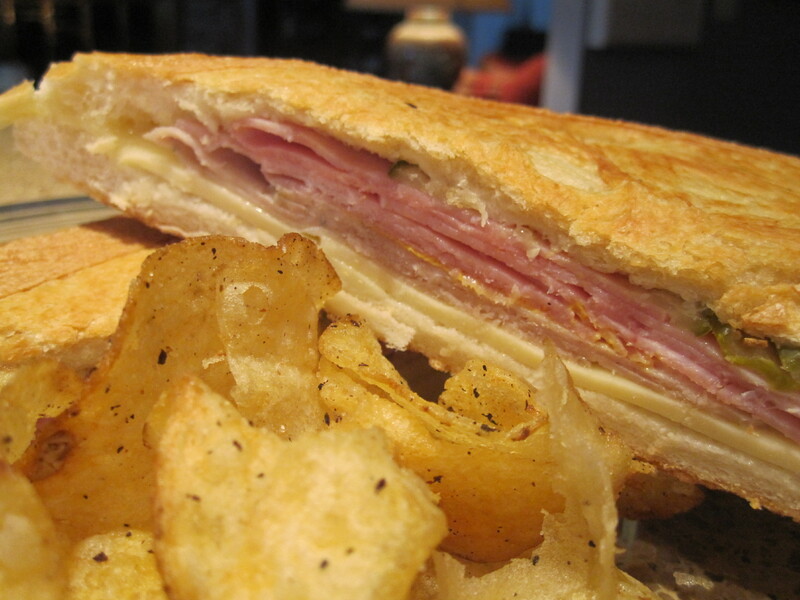 I can taste that crispy Cuban bread…..
Oh, the Cuban sandwich. I also moved to Nashville from Tampa and always bring loaves of Cuban bread home with me after a visit. Have you tried Back to Cuba off 65 at Harding? It is the best Cuban food I have found around here. We wanderedd in to a Cuban restaurant while lost in Miami several years ago and I had my first Cuban sandwich and have been hooked every since. If you ever get over to East Tennessee, there is a little hole-in-the -wall place in Maryville that serves the real thing and it’s as good as I ever had. I made my first one a while back and it turned out pretty good -( http://bigdudesramblings.blogspot.com/search?q=cuban+sandwich), but the little restaurant has a viniagrette sauce they serve on the side that kicks their’s up several notches above mine. Where in Maryville? My husband is from there and we get over to the Knoxville area frequently. I picked up a Cuban at Publix for lunch yesterday– absolute heaven! We lived in Ponte Vedra, FL for 8 years, and there was a Columbia restaurant in St. Augustine. We loved to go there and eat platters of the bread, black beans and rice and incredible shrimp dishes. It was always a highlight of a weekend. Thanks for sharing your Cuban with us. The restaurant is the Aroma Cafe on the Old Knoxville Highway in Maryville. Across the road from Village Pharmacy – near Richy Cream donuts. They are all Cubans and I love their sandwich. Let me know if you get to try it.